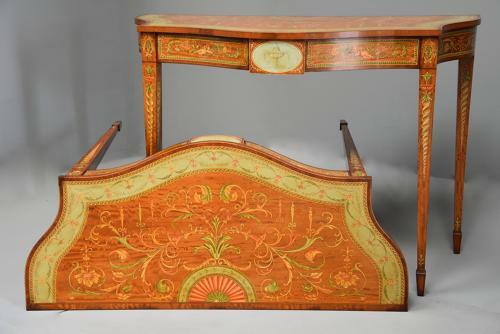 This pair of tables consist of superb and finely painted satinwood tops of typical Adam style Classical decoration including fan, decorative borders, finely painted scrolling foliate decoration having satinwood banding with mahogany & boxwood stringing to the back edge with a mahogany & boxwood stringing with amboyna crossbanding to the outer shaped edge. This leads down to the frieze with central panel consisting of a finely painted classical urn within an oval painted panel, to either side painted satinwood panels depicting cherubs holding floral filled cornucopia, these panels with amboyna surrounds, the side panels consisting of finely painted satinwood panels of scrolling foliate decoration with amboyna surrounds. To the top of each leg the tables have painted paterae of griffin heads and floral and foliate decoration leading down to the tapered legs consisting of finely painted urn and elongated spiral decoration terminating with spade feet. This pair of tables are in excellent condition for age, are of stable construction and can go straight into a home.